Take a photo of the entrance to campus, preferably with you in the photo! Most colleges and universities have a noteworthy gateway that includes the name of the college or university. Stop on your way in to take a picture. Later, when you're back home, this visual reminder will come in handy as you review and evaluate all the colleges you visited. If the college you are visiting requires a parking pass, grab your phone when you exit the car to enter the Visitor Center. Take a photo of your car's license plate before you enter. If the Center requires your license plate number, you won't have to go back outside to get it. Just pull up the photo on your phone to read it off. Find out which schools on your visit list have a text message or an e-mail alert system. Sign up a day or so before you hit the road. This can come in handy if severe weather or other factors occur that affect school closings. You can always unsubscribe once you're back home. Location check-in services such as Gowalla or Foursquare aren't just fun ways to let folks know where you are, at some schools a check-in may result a reward either virtual or real. Prospective students who check-in at the University of New Haven can earn a fee-waiver for the application fee. Many colleges offer a self-guided walking tour available either as a web-based application or as a mobile app. Search for this on the school's website. The number of colleges offering mobile apps is on the rise. Apps for prospective students include engaging, interactive apps such as scavenger hunts and navigational, mobile campus guides making it easy and fun to explore campus. SmartCollegeVisit.com recently developed the "Visit Virginia Tech" mobile app. Check it out if you're visiting their campus and let us know what you think! “Where are you now?” - text messaging comes in handy when parents and teens need to meet up when attending different tours or information sessions. CUL8TR. Z. Kelly Queijo is president of Smart College Visit, Inc., a higher ed marketing and college visit planning portal, which she founded in 2009. Kelly is passionate about mobile app development, especially when it comes to creating travel and location-based tools and services for colleges and universities. 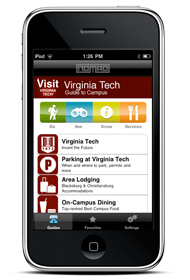 “Visit Virginia Tech,” a mobile campus guide and her company's first app, was released in 2011. SmartCollegeVisit.com has been listed in the Top 100 education advice blogs and as one of the top 5 college visit sites by her peers. Her popular weekly Twitter chat "CampusChat" provides education experts, parents, and students with a forum for insightful interaction. A Virginia Tech alumna, Kelly held the position of Undergraduate Admissions Marketing and Public Relations Coordinator for Virginia Tech from 1993-2000. She is the former Director of i-Recruitment Services for Carnegie Communications and Internet Sales Manager for CollegeNET, both of which provide web-based services to college admission offices. An award-winning writer and marketing campaign developer, Kelly is the 2010 VT Knowledgeworks Entrepreneurship Summit award winner for best business concept.